We are firmly in the Whittakers camp when it comes to chocolate, not only because it tastes better but also because it is New Zealand made. However occasionally Cadbury brings out a limited edition flavour that makes me jump ship for a short time. 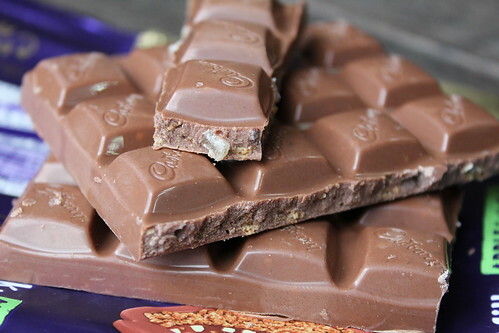 Cadbury has been busy with Oreo cookie creations as well as Lamington and Apple Crumble. I couldn’t find these flavours on the New Zealand website which I thought was a bit strange. Then I did a google of the flavours not including the NZ tag to see if I was looking in the wrong place and voila, they are Australian! Cheeky Ozzie Cadbury….. I didn’t even consider that the chocolate wasn’t made in New Zealand. I have heard that the Ozzie Cadbury chocolate is a different recipe to our NZ Cadbury chocolate due to the higher temperatures over there. They need a less meltable chocolate. I don’t know if this is true as I haven’t bought any Ozzie Cadbury chocolate to compare and to be honest, I haven’t cared enough to research it. I just stick with my 5-roll refined and I’m happy. 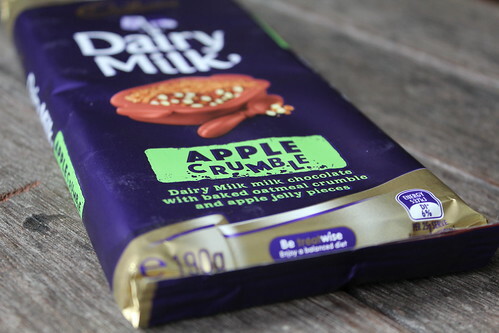 Anyway, short story, I bought the Apple Crumble Chocolate thinking it was NZ Cadbury. I’d probably have still bought it knowing it was Australian Cadbury because of the “Apple” flavour but that’s not really the point. Now I know about it I shall be picking up all the Cadbury blocks I might be tempted to purchase and read the fine print to find out where they originate from. 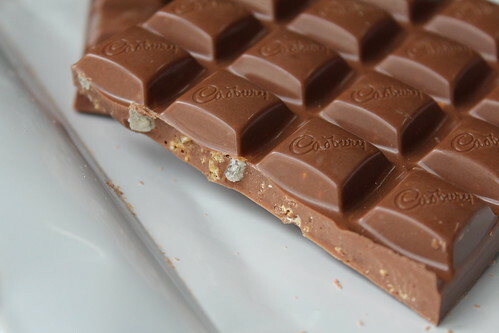 But back to the Apple Crumble Dairy Milk Chocolate – it is dairy milk milk chocolate with baked oatmeal crumble and apple jelly pieces. 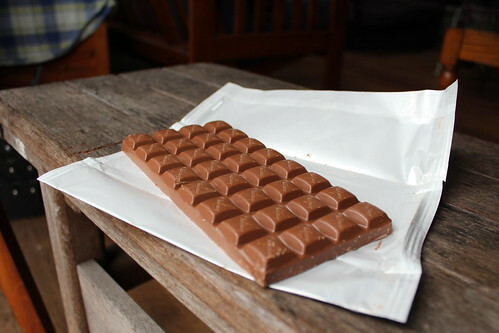 As far as chocolate goes, it is ok. It isn’t particularly apple flavoured and if I closed my eyes and tried to guess the flavour, I’m not sure apple would be the answer. The textural difference between the crumble and jelly pieces is pleasant. Would I buy it again – well, I haven’t so far. I’ve tried it once, it was ok. The Lamington variety was better but again, I’ll probably not buy it again due to the fact it is both Cadbury and not NZ Cadbury at that. However if you aren’t a stickler for kiwi made products and like flavours that are a little bit different to the norm, give Apple Crumble and Lamington a go. If you don’t mind supporting a company that seems to think it’s consumers are a bit thick then keep supporting Cadbury and prove them right. Oops, is that a bit too harsh??? 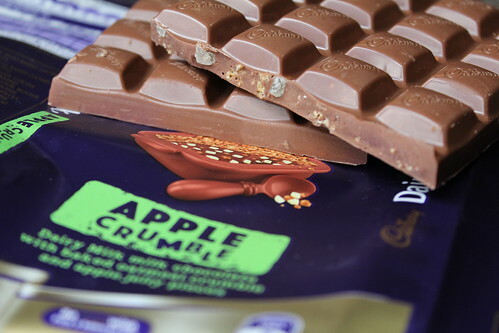 This entry was posted in Product Review and tagged Apple Crumble Chocolate, Cadbury Apple Crumble Dairy Milk Chocolate by Jo Dohrman. Bookmark the permalink.